I am so glad that summer is over. Yep, I said it, I hate summer. But autumn, autumn is different. It’s all snugly and crisp and comforting. So when the air had a particular nip in it last week, I dug out the slow cooker. This stew is a meat lovers dream. It uses two different meats: oxtail which is beef and pork cheek. Hence the name see! Oxtail isn’t as cheap as it once was, but it is still good value I think. Pork cheek is cheap as chips though. I think I had five in this stew for less than three quid and they yield a lot of meat. 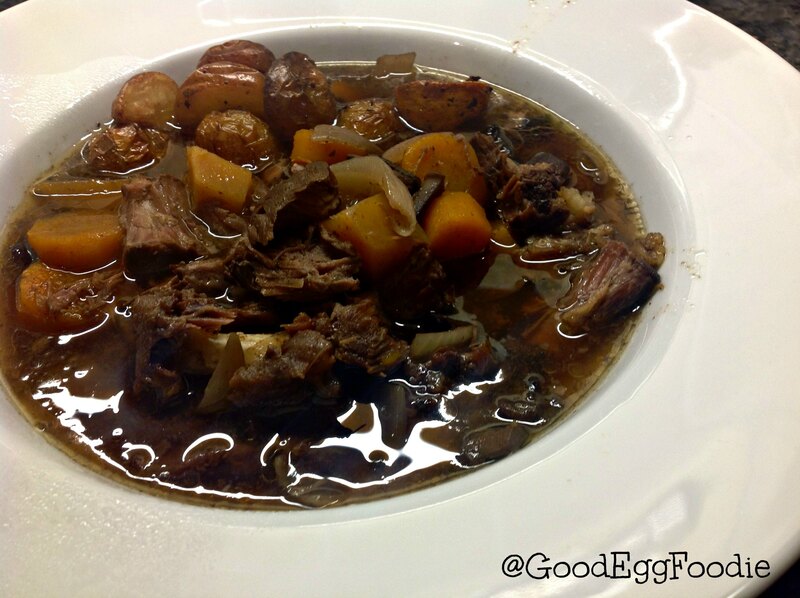 Both break down beautifully during a long, slow cook and there really is no need for a knife with this stew. Just a spoon and some chunky bread for all that lovely gravy! About half an hour before you are going to serve, fish out the meat, shred and return it to the cooker. This ensures that a) everyone gets some of the oxtail and b) every mouthful will have a meaty mix. You can chuck the oxtail bones back in as they always add to the flavour, just fish them out when you serve. Serve with something to soak up the goodness: mash, crusty bread or both!